You’ve probably figured out by now I have a slight space exploration addiction. I was there for the final space shuttle Atlantis launch last July and thanks to Eileen Ludwig of Freelance Tourist, I saw Atlantis make its final landing. 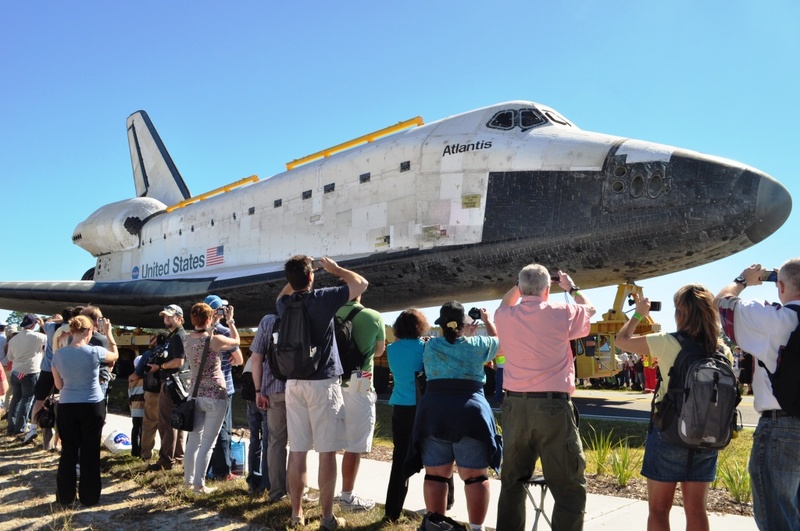 Friday, Nov. 2, space shuttle Atlantis made one last journey to its final home at Florida’s Kennedy Space Center Visitor Complex and I was there to wish her well. 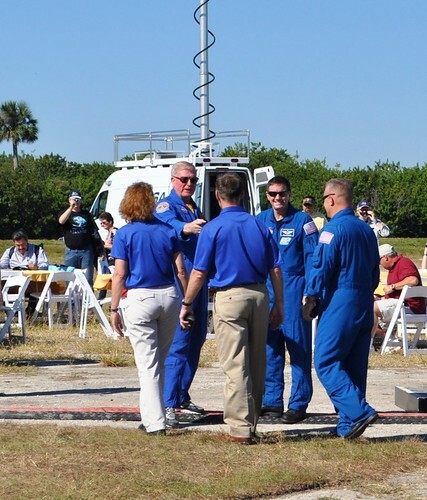 Unlike several friends, I didn’t have special access and purchased a package through the KSC Visitor Complex which allowed me to hear astronaut space shuttle astronaut Jon McBride and crew from the STS-135 mission; the final space shuttle mission (Chris Ferguson, Commander; Doug Hurley, Pilot; Sandy Magnus, Mission Specialist 1; and Rex Walheim, Mission Specialist 2); NASA Administrator Charles Bolden and Kennedy Space Center Director Robert Cabana. 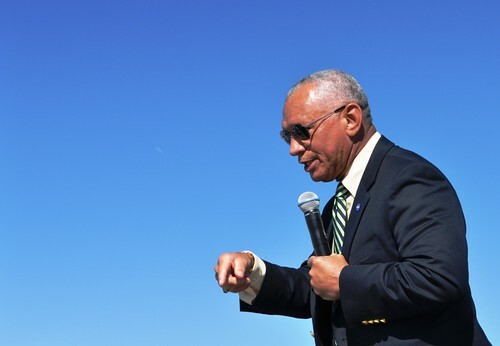 NASA Administrator Charles Bolden Told Attendees to "Dream Big." Although I caught the end of it, the conversation between Bolden and Cabana was inspiring. “Dream big,” Bolden told attendees, encouraging them to never give up in pursuing their dreams. What's a Lt. 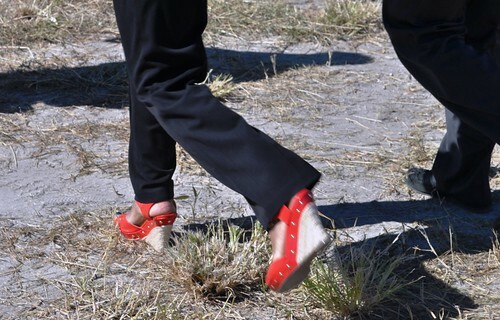 Governor Wear on Her Feet? Fun, Red Shoes. Florida’s Lt. Gov. Jennifer Carroll also gave remarks (check out her fun shoes!) 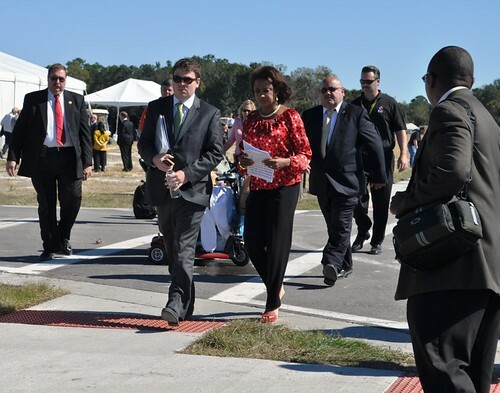 as well as other NASA personnel and representatives from the private sector, who are continuing the legacy of U.S. human space travel. 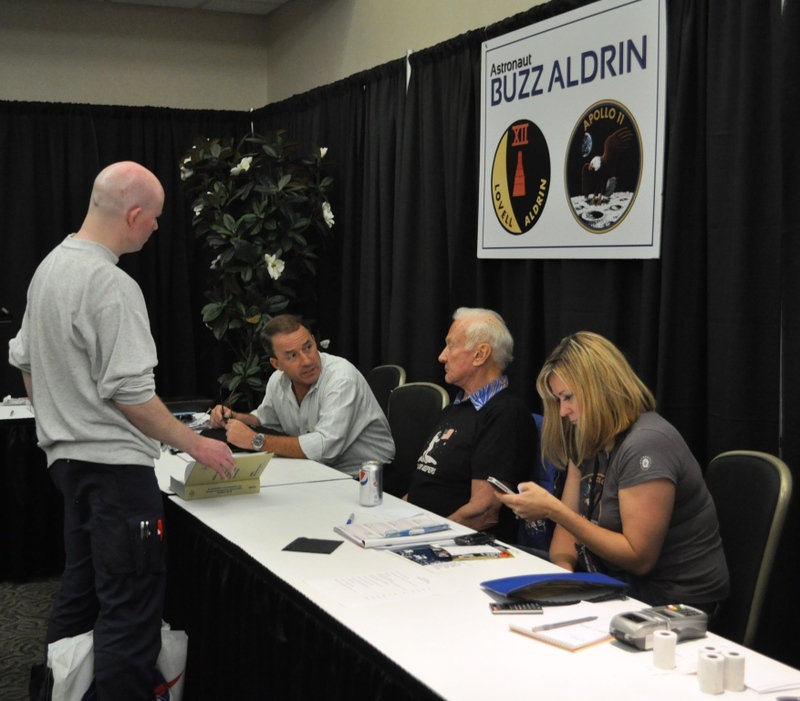 A host of displays educated visitors about the present state and future outlook of space exploration. Of course, the highlight of the afternoon was seeing space shuttle Atlantis slowly make its way to the new, 90,000-square-foot interactive exhibit at the KSC Visitor Complex. The space shuttle program’s 30-year history will be told in this new facility, set to open in summer 2013. Honestly, I though there would be more fanfare when the shuttle rolled out but I suppose the medley of patriotic music piped into the air meant something was happening. The way Atlantis was mounted on the trailer made it look as though it was coasting above the roadway. 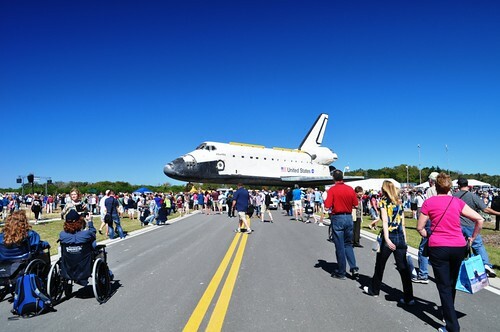 Security instructed everyone to stand back away from the road because of the shuttle’s wingspan. 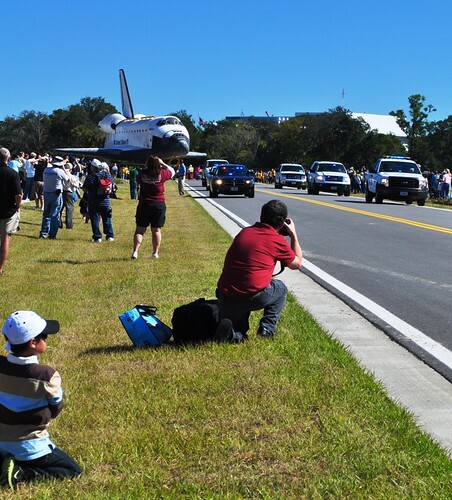 Of course, once the shuttle was in view, some people ran into the road for a better photographic shot. After it came down the straightaway, it parked so visitors could get pretty close for those Facebook bragging rights photos. “That’s one big spaceship!” I overheard a little boy yell. Too cute. My stomach is still recovering from the Brazil trip meaning I’ve been eating pretty bland food but when I visited the new Rocket Garden Cafe in the KSC complex, I needed to sample something. That something was a little spicy but oh, so good. If cooked in too hot of an oil, conch fritters can turn out dark and crispy on the outside but doughy inside. The ones I enjoyed at the Rocket Garden Cafe were cooked to perfection and served with cocktail sauce, although I would have preferred a mustard-based sauce. 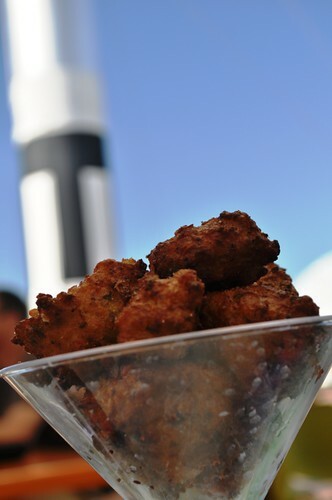 These conch fritters ($7.50) were nothing like the rubber hotdogs we consumed for nourishment during our 1981 visit. Other menu items include: Mahi Mahi Ceviche ($12.50), Vegetarian Frittata ($9.50) and Mediterranean Flat Bread Pizza ($12.50). Of course, at the other eateries, the standard chicken strips, hotdogs and fries are served. 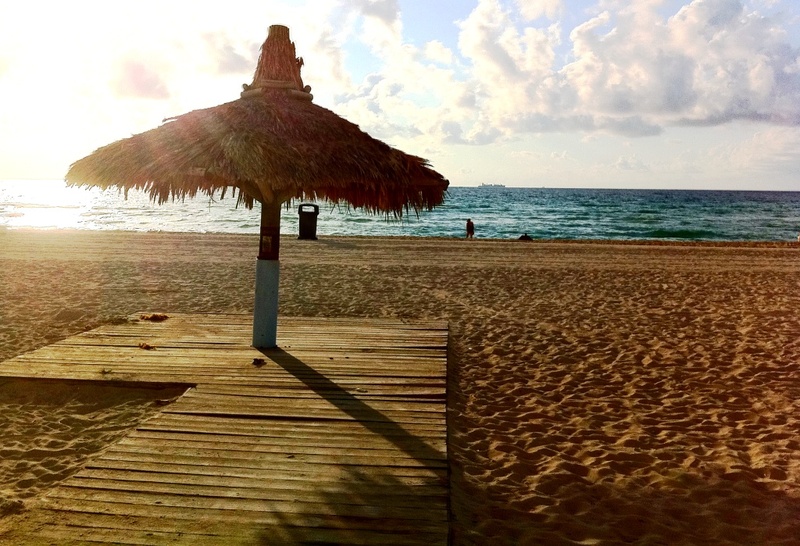 Am I counting down for summer 2013? You betcha! Located less than an hour’s drive east of Orlando in Brevard County, the Kennedy Space Center is a must-see attraction when visiting Florida. 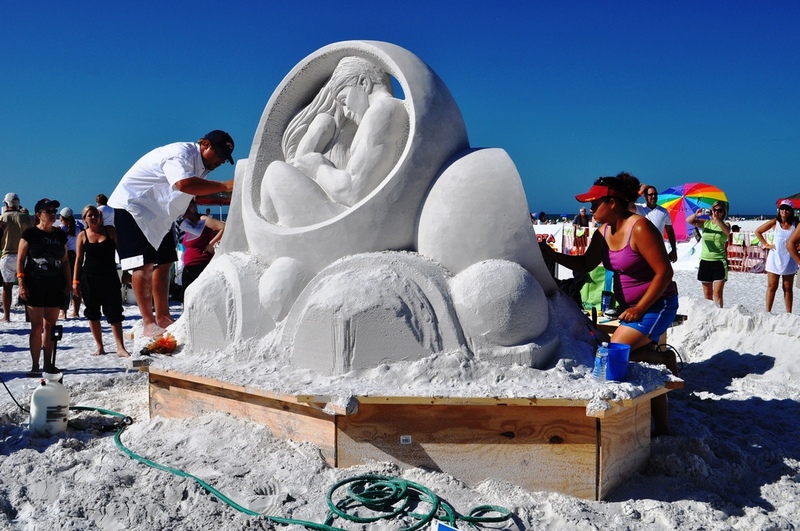 (The drive is about three-and-a-half hours from my home in North Port.) 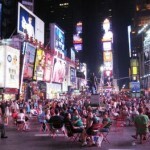 It opens daily at 9 a.m. (closed December 25) and certain launch days. Admission includes IMAX® space films, all exhibits and shows, the Kennedy Space Center Bus Tour and the U.S. Astronaut Hall of Fame®. 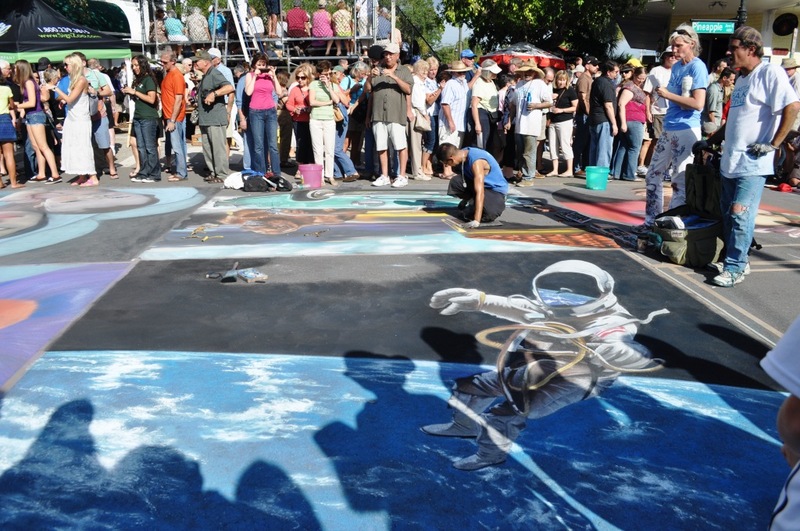 Admission tickets include a second day free for use at the U.S. Astronaut Hall of Fame if used within seven days. Admission also includes the U.S. Astronaut Hall of Fame®, featuring historic spacecraft and the world’s largest collection of personal astronaut memorabilia. Visit www.KennedySpaceCenter.com or call 877-313-2610 for additional information.